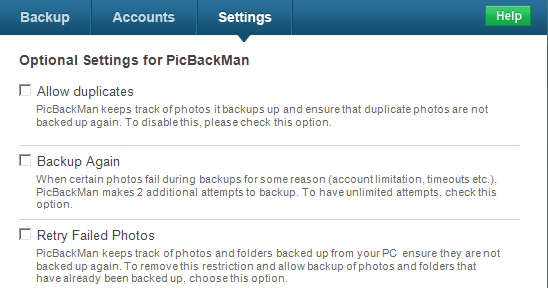 PicBackMan is a small application (less than 2 MB) but can save hours of your work daily. If you use two or more of these online service ranging from Facebook, Box.net, Dropbox, Picasa, SkyDrive, Smugmug or Flickr and you share images with other people, then uploading the same image to different networks becomes difficult. But PicBackMan can help you do this automatically. The app is very similar to Social Folders but with an added advantage of uploading the images to Dropbox and SkyDrive. PicBackMan is a small application for Windows (Mac, iOS and Android versions will be launched later) that uploads images to all the above listed social networks and file uploading websites automatically. You can set it to monitor a particular folder and it will upload the files you store in that particular folder automatically. Not only this you can also set it up to download images from Facebook, foursquare and Instagram. It will automatically download images from these networks to the folder you specify. Download the application from their official site. Install and run the app. You will see a screen like below. First register a new account with PicBackMan. After registration you can login using the same id and pass with which you registered. Now I suppose you must have logged in, you will see three tabs at the top. The Backup tab is to associate folders from which the app will upload files to the network you select. Remember, you can select as many folders and all folders can be attached to any number of services. For example, you can dedicate a folder, images from which will be uploaded to Facebook, Picasa and Flickr and another folder which will be used for Facebook, Dropbox, and Box.net. Accounts tab will let you connect all your accounts which you want to use with PicBackMan. 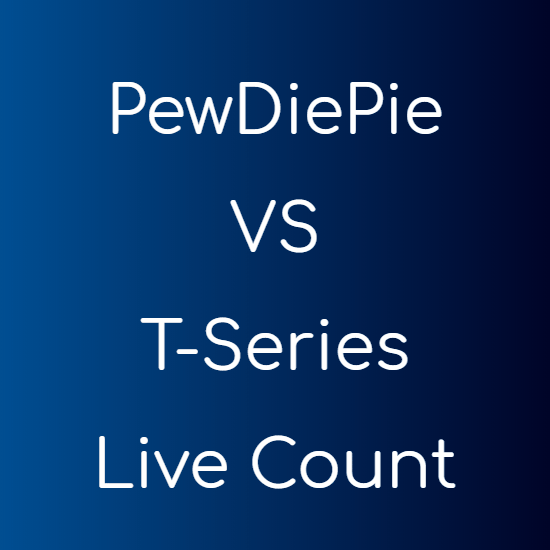 You can connect any number of accounts and they all will be remembered by the app. 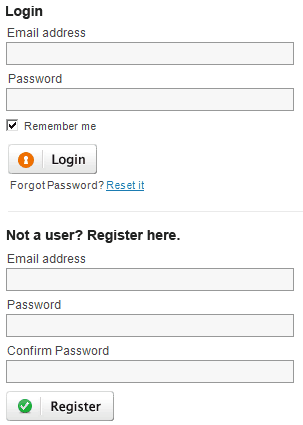 You even don’t need to enter your passwords again and again. Settings tab lets you specify some general settings like you can allow duplicate files, try to backup indefinitely if an image fails to be backed up and to upload images even if they fail to get uploaded in the first attempt. Now you just need to start connecting the accounts you use from the “Accounts” tab, then select the actions from the “Backup” tab and alter the settings if you feel like doing it. P.S. As said earlier, the app is quite similar to Social Folders, but Social Folders also allows you to download the images from your friend’s Facebook albums. The app is quite useful if you share your photos with your friends on these sites and you don’t want the hassle of uploading them to all the sites one by one. 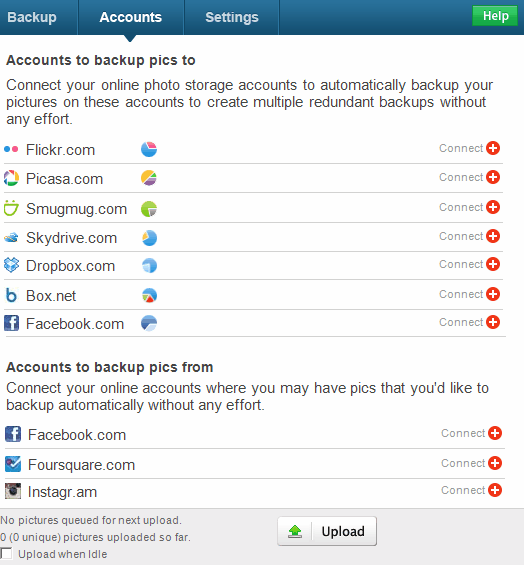 Also you can keep backup of all your online images on all your social networks. awesome.. just the one I needed.